Price includes full colour print front. Print on back or left add 20p each if required. Delivery & VAT extra. A short and flat cable with logo customised body and cable that is suitable for both data transfers and the charging of devices, equipped with four connectors: standard USB, two Type C connections, and Lightning connection with incorporated Micro adaptor. This multi-cable allows you to connect various devices, up to 6 combinations thanks to the double Type C connector and the Lightning and Micro 2 in 1 connector at each end. 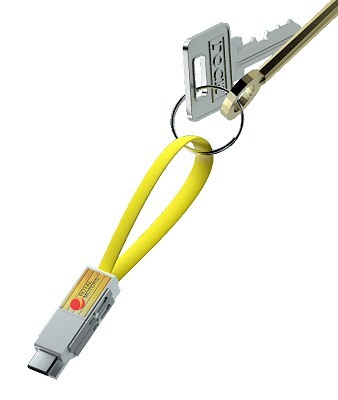 When they are not in use, the outer connectors remain securely fastened with a magnet, so that the cable can be conveniently attached to ties or keyrings. Both the silicone cable, available in various colours, as well as the connectors, can be customised with a company logo in serigraphy. Front, Back Left logo printing: Silk-screen Printing, CMYK printing.